Particles in the intake air significantly impact the performance and efficiency of gas turbines and turbocompressors and can lead to corrosion on the turbine blades or fouling on the compressor blades. Protect your plant against such damage and against unscheduled downtimes with customer-specific filtration solutions. Multi-stage filtration systems ensure effective filtration and increased protection of turbines and compressors. Damage due to fouling is kept to a minimum. Unplanned downtimes can be avoided, the general maintenance costs are reduced and optimal turbine efficiency can be achieved. In a two-stage system, the cassette filter of the final stage is protected by an upstream pocket filter. In three-stage systems, another downstream cassette filter stage is added. This can provide filtration levels up to EPA standard. The selection of filters for each stage depends primarily on the environmental conditions around the plant, as well as on any space limitations. Power output will be influenced by the performance of installed intake air filters and the dust particle concentration at a gas turbine’s location. 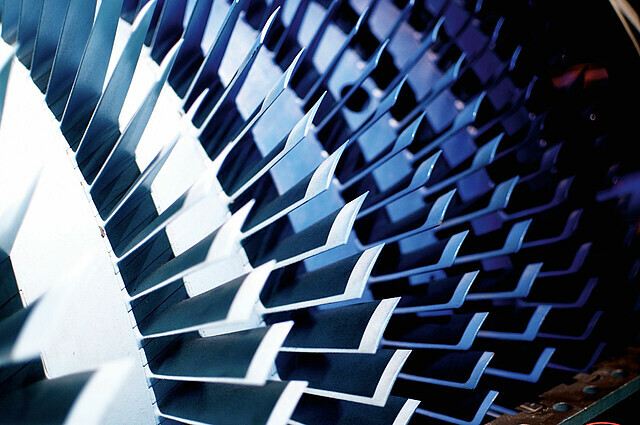 Are you aware of the effect of air filtration on gas turbine performance degradation? Standardized systems for intake air filtration are frequently inefficient and do not make full use of their potential for optimization. The more specifically filter systems are customized to the respective ambient conditions and plant requirements, the greater performance and reliability they achieve. Our experts work with you to develop the best filter solution for your plant on the basis of the testing standard ISO 16890. In the filter evaluation, typical urban and rural particle size distributions are considered based on the particulate matter fractions PM1, PM2.5 and PM10, and filter efficiency grades are determined accordingly. Whether conversion or new construction – implement your individually customized system solution anywhere in the world with the comprehensive engineering development and installation services of Freudenberg. Filter systems achieve maximum performance when they are adapted to the specific requirements. We therefore offer you individual service packages for planning and installation: from on-site analysis, consulting, system design and order processing to training and after-sales service – discover the most efficient solution for your future plant with the help of our team of technicians. The independent institute EUROVENT Certification has developed an international certification program for fine filters that has recently been revised on the basis of ISO 16890. All Viledon fine filters are certified by EUROVENT. EUROVENT, the European association of manufacturers in the HVAC industry, has developed a classification system for the energy efficiency of air filters. Freudenberg has contributed significantly to the development of this classification. Your advantages: Energy-efficient filters can be identified at a glance. Benefit from our specialized expertise in gas turbines and compressors. Optimal protection against penetrating water and salt – offshore or in coastal regions and locations with high humidity. Special drainage properties prevent the passage of water droplets into subsequent filter stages. The increased overall depth results in especially high dust storage capacity and a long service life. Heavy-duty and dependable. Water-repellent features. Part of the Viledon modular clip-on system. Top performance with an optimal price-performance ratio. Especially suited for onshore sites with moderate dust concentrations. With the modular clip-on system for 2-in-1 filtration solutions. Variants with 21 or 30 m² filter area for high-performance demands. Especially suited for onshore sites with moderate dust concentrations. With the modular clip-on system for 2-in-1 filtration solutions. Pulse-jet filter cartridges GTS, GTS-10 and GTB extend the lifetime of air intake systems with optimal results under all climatic conditions. Static GTG cartridges are best suited for high concentrations of fine dust. Reliable removal of contaminant gases from the supply or recirculating air. The modules are an assembly of Honeycomb (HM) media housed in either a plastic or metallic frame. Easy to install.